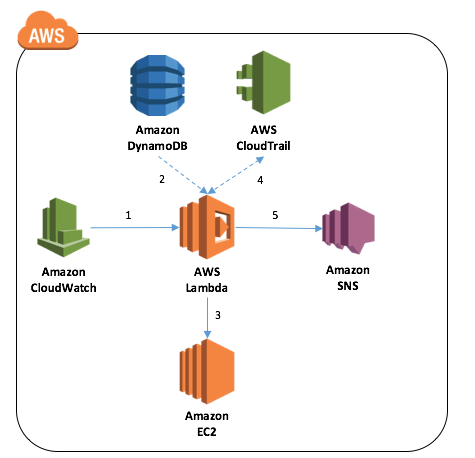 Customers are using AWS Lambda in new and interesting ways every day, from data processing of Amazon S3 objects, Amazon DynamoDB streams, and Amazon Kinesis triggers, to providing back-end processing logic for Amazon API Gateway. In this post, I explore ways in which you can use Lambda as a policy engine to manage your AWS infrastructure. Lambda’s ability to react to platform events makes it an ideal solution for handling changes to your AWS resource state and enforcing organizational policy. I have created a sample application that demonstrates how to create a Lambda function to verify whether instances launched into a VPC conform to organizational tagging policies. Tagging policies are important because they help customers manage and control their AWS resources. Many customers use tags to identify the lifespan of a resource, their security, or operational context, or to assist with billing and cost tracking by assigning cost center codes to resources and later using them to generate billing reports. For these reasons, it is not uncommon for customers to take a “hard-line” approach and simply terminate or isolate compute resources that haven’t been tagged appropriately, in order to drive cost efficiencies and maintain integrity in their environments. The tagging policy example in this post takes a middle-ground approach, in that it applies some decision-making logic based on a collection of policy rules, and then notifies system administrators of the actions taken on an EC2 instance. The tagging policy function uses an Amazon CloudWatch scheduled event, which allows you to schedule the execution of your Lambda functions using cron or rate expressions, thereby enabling policy control checks at regular intervals on new and existing EC2 resources. Tag policies are pulled from DynamoDB, which provides a fast and extensible solution for storing policy definitions that can be modified independently of the function execution. The function looks for EC2 instances within a specified VPC and verifies that the tags associated with each instance conform to the policy rules. If required, missing information, such as user name of the IAM user who launched the instance, is retrieved from AWS CloudTrail. A summary notification of actions undertaken is pushed to an Amazon SNS topic to notify administrators of the policy violations and actions performed. Note that, while I have chosen to demonstrate the CloudWatch scheduled event trigger to invoke the Lambda function, there are a number of other ways in which you could trigger a tagging policy function. Using AWS CloudTrail or AWS Config, for example, youI could filter events of type ‘RunInstances’ or create a custom config rule, to determine whether newly-created EC2 resources match your tagging policies. 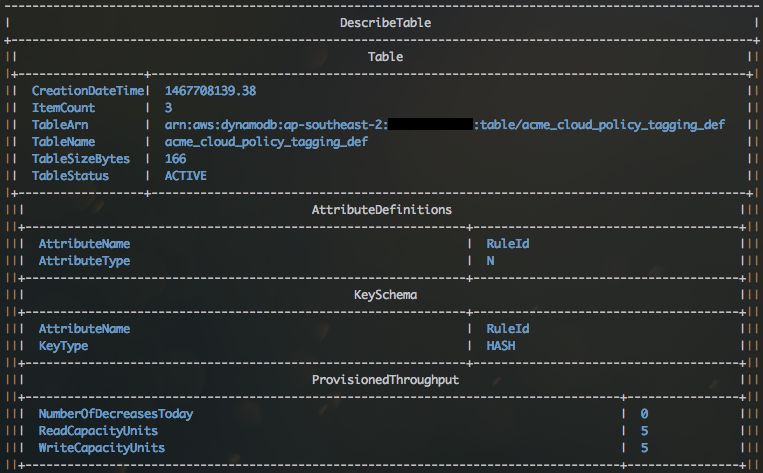 This walkthrough uses DynamoDB to store the policies for each of the tags. DynamoDB provides a scalable, single-digit millisecond latency data store, supporting both document and key-value data models that allows me to extend and evolve my policy model easily over time. Given the nature and size of the data, DynamoDB is also a cost-effective option over a relational database solution. The table you create for this example is straightforward, using a single HASH key to identify the rule. These attributes will help build a list a list of policy definitions for each tag and the corresponding behavior that your function should implement should the tags be missing or have no value assigned to them. In this example, the default behavior for instances launched into the VPC with no tags is to terminate them immediately. This action may not be appropriate for all scenarios, and could be enhanced by stopping the instance (rather than terminating it) and notifying the resource owners that further action is required. The Update action either creates a tag key and sets the default value if they have been marked as required, or sets the default value if the tag key is present, but has no value. The UserLookup action in this case searches CloudTrail logs for the IAM user that launched the EC2 instance, and sets the value if it is missing. Now that the policies have been defined, take a closer look at the actual Lambda function implementation. The first thing you need to do before you create the Lambda function to execute the tagging policy is to create a trigger that runs the function automatically after a specified fixed rate expression, such as run "rate(1 hour)”, or via a cron expression. For this example, you create a Python function. The function itself is broken into a number of subroutines, each performing a specific function in the policy execution. The emailed report generated by the policy engine generates the following output. The format of the notification is, of course, customisable and can contain as much or as little information as needed. These notifications can also act as a trigger themselves, allowing you to link policies. As I have demonstrated, using Lambda as a policy engine to manage your AWS resources and to maintain operational integrity of your environment is an extremely lightweight, powerful, and customisable solution. Policies can be composed in a number of ways, and integrating them with various triggers provides an ideal mechanism for creating a secure, automated, proactive, event-driven infrastructure across all your regions. And given that the first 1 million requests per month are free, you’d be able to manage a significant portion of your infrastructure for little or no cost. Furthermore, the concepts presented in this post aren’t specific to managing your infrastructure; they can quite easily also be applied to a security context. Monitoring changes in your security groups or network ACLs through services like AWS Config allow you to proactively take action on unauthorised changes in your environment.